Only Harry Kane (20) has scored more Premier League goals for Spurs at Wembley than Son Heung-min (16). 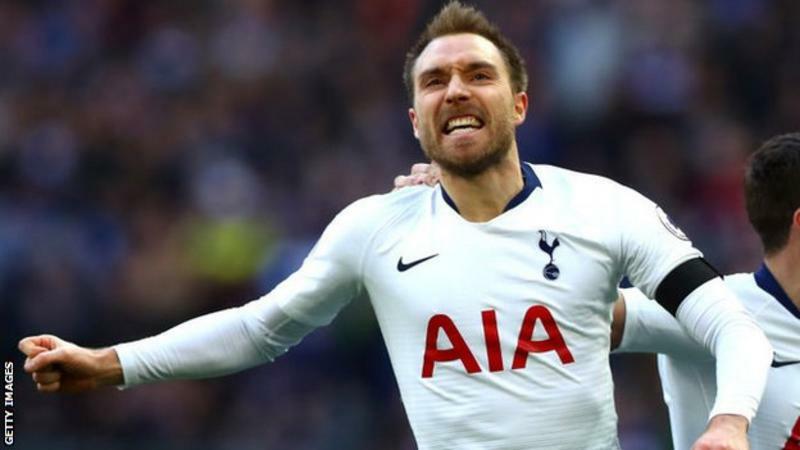 Tottenham ensured they remain in contention in the Premier League title race as Mauricio Pochettino's side earned victory against Leicester at Wembley. Spurs had to weather a late Foxes fightback to remain third in the table after 26 games, but reduced the deficit to leaders Liverpool - who beat Bournemouth on Saturday - to five points. Christian Eriksen provided a pin-point cross to set up Davinson Sanchez's first Tottenham goal after 33 minutes, before producing a moment of quality to double the hosts' advantage from the edge of the area in the second half. The Dane's strike came just three minutes after omitted Leicester striker Jamie Vardy emerged from the bench in dramatic fashion to take a penalty on the hour mark - only to be denied by goalkeeper Hugo Lloris. Vardy made a demonstrable difference to Leicester's attack and converted from Ricardo Pereira's low cross to set up a tense finish, before the in-form Son Heung-min made sure of a home win in stoppage time. It's a fourth consecutive league win for Tottenham who remain in touch with Liverpool and Manchester City at the summit with 12 league games remaining. Such phrases are quickly becoming synonymous with Tottenham's title bid and, despite the final scoreline, this entertaining battle certainly fit the trend. Perhaps understatedly, Mauricio Pochettino described Sunday's meeting with Leicester as "key" as the title race hurtles towards its conclusion - trailing Liverpool by eight points, this fixture was firmly in the 'must win' category for Spurs. Having produced several gritty late shows in recent weeks, Spurs appeared second best in the opening half hour but edged ahead - somewhat against the run of play - as Eriksen took his time to judge the smart run of Sanchez into the six-yard box. But Tottenham struggled to shake off their visitors and were left frustrated as Son's penalty claims received a yellow card for simulation under Harry Maguire's tackle. The game was ultimately decided in a period of three second-half minutes, as Lloris denied Vardy from the spot before Eriksen's excellent finish to Schmeichel's right swung the game away from Leicester. Pochettino's side were once again forced to call upon the resilience that has kept them snapping at the heels of Liverpool and Manchester City, and Wembley breathed a sigh of relief as the lively Son scored for a third consecutive match. It's well documented that Tottenham's charge has come in the absence of key figures - with Harry Kane and Dele Alli now close to returns - and Spurs' current run in the face of such circumstances suggest they are primed to go the distance. The Argentine's side may have picked up another crucial three points, but Pochettino was not short of complaints at the full-time whistle as Son became the fourth Spurs player to be booked for diving this season. The 46-year-old described the decision of referee Michael Oliver to book the South Korean for simulation as "unbelievable" after he fell to the ground under pressure from Harry Maguire. "I am more relaxed now because we won the game, but so disappointed with the situation because everyone wants to talk about different clubs or players, but do you think we are a team that is trying to cheat the referee?" said Pochettino. "Come on, we are the most innocent people on the pitch. "Unbelievable, unbelievable, unbelievable. I am a person that always accepts the mistake but I think it was so strange the situation today." And the Tottenham manager once more voiced his objection to the Premier League schedule, as Spurs now face a quick turnaround before facing Borussia Dortmund on Wednesday. The Bundesliga leaders played their fixture against Hoffenheim on Saturday. "There are no complaints if Dortmund play today but they played yesterday and today they start to prepare while we play. It upset me a lot," added Pochettino. "It's difficult but I am going to show I'm upset to schedule such an important game like this." The Foxes have proved difficult customers for 'big six' sides this season - a reputation that was reinforced against Manchester United last weekend despite ultimately falling to defeat. However, questions over Claude Puel's position - a persistent shadow over Leicester's season - once again surfaced prior to kick-off as the Leicester manager excluded talisman Jamie Vardy from his starting line-up. A positive approach from Puel's side caused Tottenham consistent problems, but Vardy's absence was telling as Leicester's bright but wasteful start amplified the 32-year-old's importance to the Foxes. Harvey Barnes twice lacked the composure to beat Lloris after racing into the penalty area, while Maguire also fired a powerful header which was tipped over by Lloris. The eventual, dramatic introduction of Leicester's top scorer after Jan Vertonghen was judged to have fouled James Maddison failed to pay-off, and Vardy's miss from the spot was punished as Eriksen was allowed ample time to pick out a trademark cross for Sanchez. Vardy did make amends with 15 minutes remaining - racing in between Sanchez and Kieran Trippier to halve the deficit - but chasing a deserved point Son delivered a late final blow. A positive for Leicester was promising 21-year-old Youri Tielemans, taking his debut following a deadline day loan move from Monaco. The Belgian impressed with an energetic midfield performance that saw him cover more ground than any team-mate. Beginning alongside Wilfred Ndidi in the centre of midfield, after Nampalys Mendy was taken ill in the warm-up, he was a source of incisive passes throughout but could not help prevent Leicester extending their winless run to six matches, stretching back to New Year's Day. "We had the feeling we can score, we had a lot of chances and opportunities to get back into the game and it's a big disappointment in the end. We played a good collective performance and it's difficult to accept," said Puel. On Vardy, Puel added: "I told him if you feel you can take the penalty you can take it - it's not a problem." The quality of Tottenham’s tireless Christian Eriksen proved crucial at Wembley, as the 26-year-old produced two moments of quality to provide a goal and an assist at important stages of the match. Tottenham Hotspur against Leicester City has joined the Sheffield derby as the most played top-flight fixture without ever recording a goalless draw (84 meetings). Tottenham Hotspur have won 20 league games this season - only in their top-flight title winning campaign of 1960-61 have they ever won more after their first 26 matches of a season (22). Leicester City are now winless in their last five Premier League matches (D1 L4), their longest run in the division since May last year (also five). Christian Eriksen has scored 20 Premier League goals from outside the box - more than any other player since his debut in September 2013. Leicester City's Demarai Gray (22 years and 226 days) made his 100th Premier League appearance in this match against Spurs - only Emile Heskey (21 years and 114 days) played his 100th game for the Foxes in the competition at a younger age. Spurs have received four bookings for simulation in the Premier League this season, the joint-most in the competition alongside North London rivals Arsenal. Tottenham host Borussia Dortmund in the first leg of their Champions League Round of 16 tie on Wednesday (20:00 GMT). Leicester welcome Crystal Palace to the King Power Stadium in the Premier League on Saturday (17:30 GMT), and Spurs return to league duties against Burnley earlier that day (12:30 GMT).